Service Lifts - SERVICE LIFTS. DUMBWAITERS, FOOD LIFTS, TROLLEY LIFTS, GOODS LIFTS, KITCHEN LIFTS. DUMBWAITER LIFTS. Service Lifts, Dumbwaiters, Food Lifts, Kitchen Lifts, Trolley Lifts, Goods Lifts, Stock Lifts & Secondhand Lifts. ​GERMAN MADE DUMBWAITERS, FOOD LIFTS, KITCHEN LIFTS, TROLLEY LIFTS AND GOODS LIFTS. ​OVER 5000 INSTALLED IN THE LAST 30 YEARS. ​DUMBWAITERS FOR HIRE / RENT. 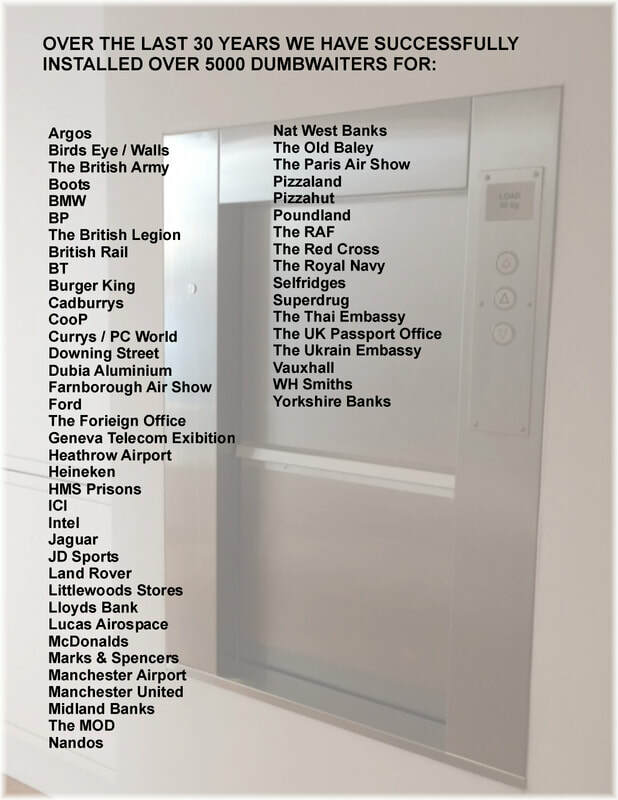 ​BKG have been manufacturing food lifts, dumbwaiters, trolley lifts, service lifts and goods lifts for over 65 years; they have shipped over 100,000 lifts to more than 70 countries worldwide. BKG are regarded inside the lift trade as being the best manufacturers of service lifts in the world. BKG offer customised solutions, high quality, short delivery times, reliability and durability. We have fitted lifts all over the UK, including Jersey, Guernsey, Isle of Man/Wight and Ireland. Internationally in France, Switzerland, Holland, Spain, Russia, Germany, Dubai, Oman, Thailand, Malaysia, Indonesia, Australia and USA. The BKG Advantage 50 and 100kg dumbwaiters are ex-stock. Either 2 or 3 floor configuration. They come with vertical bi-parting landing doors and galvanised steel structure. Floor to floor travel can be up to 7m (2 floors) or 10m (3 floors). BKG bespoke dumbwaiters are made to your requirements. BKG bespoke trolley lifts 100kg to 300kg with heavy duty hinged or concertina landing doors. Top, bottom or side drive options. All lifts have galvanised steel structures and stainless or galvanised steel finishes with fire rated doors. ​3 phase ​or single phase 240 volt ​supply. The BKG goods mover is specially developed for larger and heavier items. Complete with self-supporting galvanised steel structure and powered by an overhead worm gear and chain drive, although low headroom options are available with side drive. The lift car comes in various sizes, finishes and options. please check this page for models presently in for immediate installation. Prices vary dependant on ​model, number of floors etc and condition. The automatic lifts have automatically opening and closing doors, and lift cars with conveyor belts for up loading and unloading. Speeds of up to 1 M per second. ​They come with steel structure, built in quality for reliability. ​Automatic lifts are custom made to meet your ​requirements.